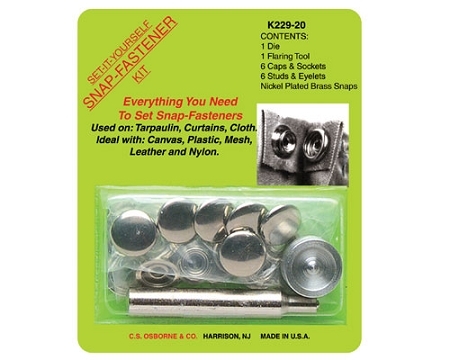 Set-It-Yourself Fastener Kit - K229 from C.S. Osborne includes parts to complete six 5/8" standard nickel plated brass button snaps and sockets plus 6 studs with posts along with flaring tool and die. For cloth to cloth application. The kit comes with instructions on the back of the card on how to use the punch.